Summary: Alphabetical, illustrated overview of many design rules, spanning fields from architecture, product design, web design, user experience, and so on. Highly recommended as an easy reference text for anyone who cares about usability and design of objects. 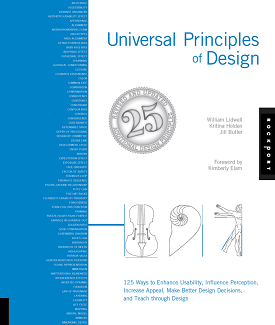 Universal Principles of Design has come highly recommended to me from people of various departments, but seems to have a special place among UI and UX designers – and for good reason. This book attempts to survey major principles from every field of design and package them in a neat, inviting, and (dare I say it?) well designed book. Universal Principles of Design is not about games, but the lessons within often intersect and overlap with situations and problems familiar to game designers. The book is 263 large, glossy pages long. Each principle of design takes up a pair of pages: on the left the principle is identified, defined, and explained in easy English, with references to studies and recommendations for further reading. On the right hand side the authors use a variety of annotated visuals (graphs, diagrams, photos) to illustrate the principle in practice. This means that you can open up the book to any page and immediately get a comprehensive and clear overview of that page’s principle. It’s easy to digest without being too simple or brief. The topics are arranged alphabetically, which means that as you read one principle may have very little to do with the next, though all fall into the broader category of “design”. Some principles are very relevant to game design – like Performance Load (“the greater the effort to accomplish a task, the less likely the task will be accomplished successfully”) or Five Hat Racks (“there are five ways to organize information: category, time, location, alphabet, and continuum”). Others are interesting as novelties but won’t make me a better designer – like the principle of Most Average Facial Appearance Effect (“a tendency to prefer faces in which the eyes, nose, lips, and other features are close to the average of a population”). If you’ve read much on usability and user experience design, then a lot of these principles will tread familiar ground. Many of the principles that didn’t get much mileage for me as a designer were related to visual design, advertising, and product design, or repeating axioms like prototyping and iteration that most designers have already internalized. The large number of principles covering architecture and environment design makes the book particularly relevant for level designers. The only caveat I have is that Universal Principles of Design don’t seem to be all that universal. Several of them actually focus on western culture bias without acknowledging it. For a simple example, the Gutenberg Diagram principle describes how eyes move across a page of information, and describes this as from left to right. But this principle is reversed or otherwise flipped in languages that are read from right to left or other directions. I have similar misgivings about other principles that make claims about how we associate empty space with expensive products, or the color red with attractive women and strong men. Meanwhile, others had to point out to me that the principle of Hunter-Nurturer Fixations regarding gender role behavior is flawed because it relies largely on a debunked study to prove its merit. Those aside, I do recommend the book. I don’t think people should take a principle from its pages and treat it as the complete truth, but as guidelines they appear really solid. I think the topic is general enough (all design fields) that the book has a lot to offer anyone, regardless of whether they know nothing about game design or have many years of experience. However! This is not a game design book, so your mileage will greatly vary depending on your own interests and needs. If, like me, you’re looking for a game design specific book set up in a similar way, Universal Principles of Game Design by Wendy Despain appears to follow a similar format (but I abstain from saying if it’s good until after I read it).